It’s wonderful to see a mainstream economics man like Paul Krugman come across a Marxist criticism by accident. I’m not surprised its Krugman who does it, he seems to be a hell of a lot more honest than just about anyone out there in the media. I found this statement in his book End This Depression Now! It’s tremendously insightful for a bourgeois economist. Now, textbooks economists says that in a competitive market, each worker gets paid his or her “marginal product” – the amount that the worker adds to total production. But what’s the marginal product of a corporate executive, or a hedge fund manager, or for that matter a corporate lawyer? Nobody really knows. And if you look at how incomes for people in this class are actually determined, you find processes that arguably bear very little relationship to their economic contribution. At this point someone is likely to say, “But what about Steve Jobs or Mark Zuckerberg? Didn’t they get rich by creating products of value?” And the answer is yes-but very few of the top 1 percent, or even the top 0.01 percent, made their money that way. For the most part, we’re looking at executives at firms that they didn’t themselves create. They may own a lot of stock options in their companies, but they received those assets as a part of their pay package, not by founding the business. And who decides what goes into their pay packages? Well, CEOs famously have their pay set by compensation committees appointed by … the same CEOs they’re judging. First notice how Krugman acknowledges class within the firm itself. Many will outright deny this and claim that there are just different positions of differing functions and importance. Second, I believe that Krugman is acknowledging that there are groups of positions within a firm that are given preferential treatment and an inequitable remuneration for the functions performed. He’s stating that the productive value of the CEOs and corporate this-and-that is questionable in comparison to how much they receive in compensation. Am I seeing what I think I am seeing? 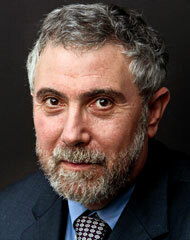 I think I’m seeing Krugman (in a way) admit there is exploitation in capitalism. It seems to me he’s pointing out how the most venerated of positions within a company are given more in compensation than they are actually contributing to the production process. It almost seems as though he’s admitting that the workers in the company, be they physical or mental labour, are being exploited! ← Femen: Shirtless Women Insensitive?